The Jewish festival Passover commemorates Moses freeing the Jewish slaves and their Exodus from Egypt. The Jewish Festival Passover is celebrated every year in March or April. The dates are different every year because the Jewish calendar is used to mark the 15th day of the month of Nissan, as opposed to the modern Gregorian calendar. The celebration lasts for eight days. 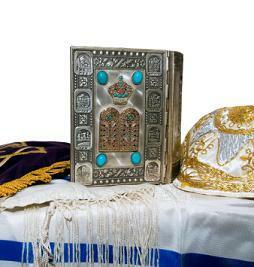 The Seder meal marks the official beginning of Passover and the Moshiach's Feast, marks the end. The name Passover has its origins in the ancient time when Pharaoh Ramses II ruled over Egypt. During this time, all Jews were slaves to Ramses. After refusing to free the Jewish slaves, Moses, as told in the Book of Exodus, told Ramses that God would curse the land with ten plagues. On the night of the Tenth Plague, it was said that all first-born male children were going to be visited by the Angel of Death and therefore, die. Before the night of the Tenth Plague, God instructed Moses to sacrifice a lamb (Pesach) and use the blood to mark the doors of the homes where all Israelites lived and the Angel of Death would not visit the children that lived in these homes. Moses did as God commanded and on the night of the Tenth Plague, the Angel of Death "passed over" all the homes marked in the sacrificial lamb's blood, hence the term Passover. Removing the Chametz - Chametz is any product that is leavened, including foods from wheat, rye, barley, oats and spelt. All utensils and cookware that are used throughout the year to cook these products are also removed from the home. Fasting - In preparation for the Passover celebration, first born male children are supposed to fast. This is done to honor the fact that Jewish first-born male children were not killed in Egypt on the night of the Tenth Plague. The first two days of Passover are celebrated with a traditional Seder meal and the re-telling of the story of Exodus. The meal is served on special plates that are generally reserved for Passover to ensure that no traces of chametz are present. The second Seder meal is the same as the first, complete with four glasses of wine, traditional Seder foods and the re-telling of the story of Exodus. No work is permitted on these first two days of Passover. These days are referred to as the Chol Hamoed and mark the beginning of the middle days of the Passover festival. During these days, people are permitted to work, but only light duties. Other observances during the intermediate days of Passover include reciting Hallel during services and adding Yaaleh Veyavo to all prayers. These traditions are observed the third through seventh day of Passover. On the seventh night, candles are lit while reciting the Passover candle lighting blessings. The meal of Moshiach's Feast commemorates the final day of Passover. This celebration is similar to the Seder meals, beginning before sunset and ending well after dark. Unlike the first two Seder meals commemorating the past, Moshiach's Feast represents a celebration of the future. Passover festival's and celebrations are steeped in tradition and remind the Jews of where they have been in the past while recognizing how far they have come as a people. This yearly celebration also reminds them of the things in life for which they are grateful. Celebrating Passover ensures that future generations will never forget the struggles of their ancestors.